You might be surprised to hear that pink is not my favorite color. Growing up I actually despised pink, and it wasn’t until the last couple of years that I started adding it to my wardrobe. This season I seem to have thrown my old rulebook out the window, having purchased three new items in this girly hue! I’ve been talking about the ricrac pieces from Lisa Marie Fernandez’s spring/summer collection for months now, but it wasn’t until I spotted this pink version of her mini dress that I pulled the trigger. I purchased it on Shopbop’s big sale over a month ago and have been waiting not so patiently to wear it! Luckily, my trip to Mexico was right around the corner. This dress was made for Mexico, don’t you think? 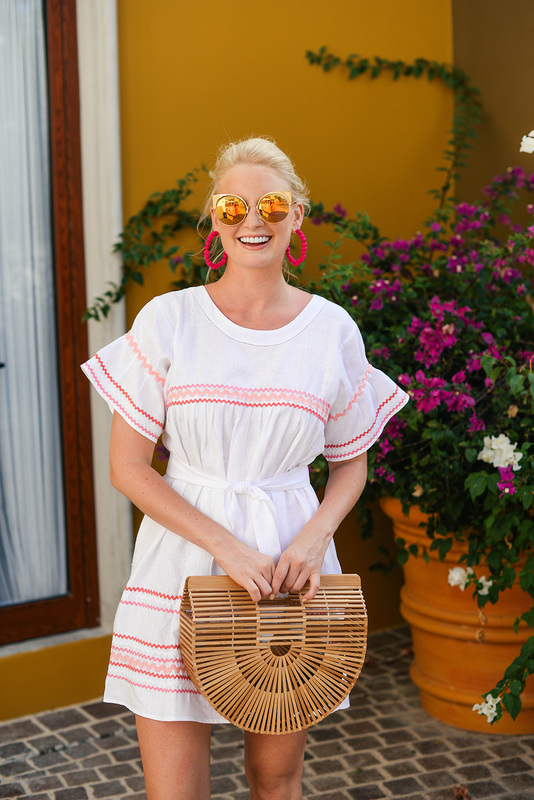 The ricrac is festive and fun, the linen fabric is lightweight for the heat and the silhouette could just as easily be worn as a coverup as it could out to dinner! Another pink item I picked up that I actually ended up wearing with this dress is this pair of hot pink hoops. They are by none other than Mercedes Salazar, the same lady who designed these incredibly lightweight statement earrings you’ve seen me in a bunch. I just LOVE her pieces! 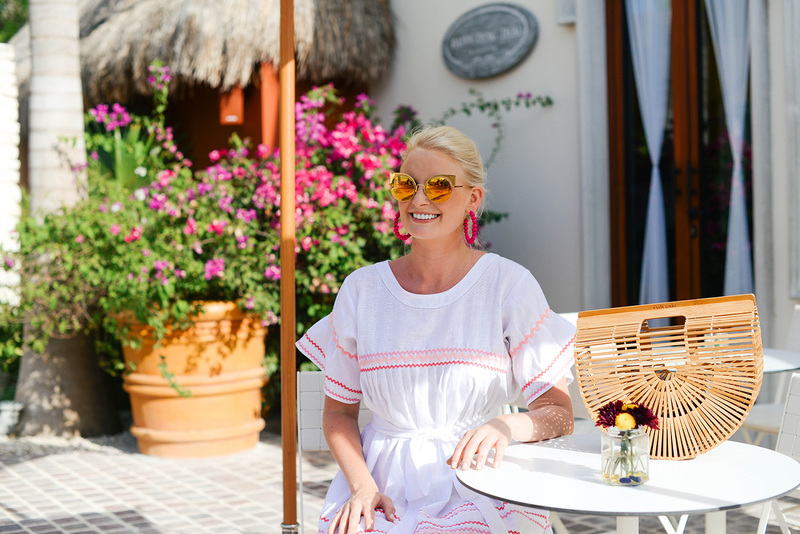 Last but not least, this bright pink ASOS dress was a total steal I picked up awhile back but just got a chance to wear in Mayakoba. You may remember I also bought it in yellow, which I wore in Port Aransas a few weeks back. Full disclosure, I had the bottom half of both ASOS dresses lined – the colored linen fabric would’ve been too sheer on its own on a hot day! So there you have it! I’m now a convert and a fan of pink… in small doses. That little dress is so cute, love it this fun summer look. Glad you convert to pink haha! It’s my favorite color! 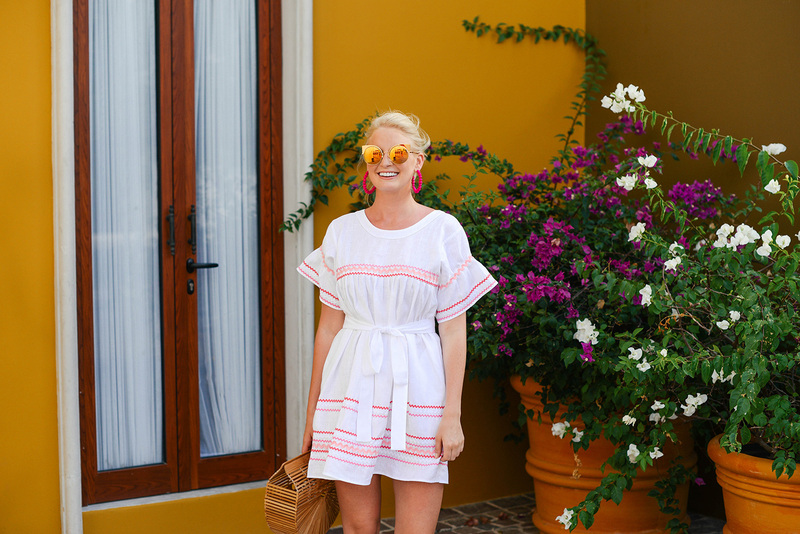 I also love that dress you have one – so cute and summery! This is adorable! Although the price is a little steep. I too am “on and off” with pink but sometimes I cave since it looks so good on blondes! Gorgeous! Perfectly styled as always!! Love love love how you styled that dress. So fun and chic! This dress is pure fiesta!!! I love it. The details on the dress are my fave part. So cute!! The perfect Mexico dress!! Love the ricrac and those earrings are perfect!